Well-versed in the messages of wampum belts, he carried three: the ancient Seven Fires Prophecy Belt about choice; the 1700's Welcoming Belt about sharing the grand natural resources and values of the original peoples with the newcomers; and the Jay Treaty Border Crossing Belt, which recognized Turtle Island as a coherent entity. In the quiet vigil that followed William Commanda’s death, his grandson Johnny revealed that he saw his beloved grandfather leaving in a canoe. “I had envisioned the same,” said Romola Thumbadoo, Grandfather Commanda’s assistant and close friend. Everything fell into place after that, and the family gained permission to bring home a birchbark canoe on display at the local school. It would “carry” home the 97-year-old spiritual leader, who died of kidney failure on Aug. 3, 2011. It was an extraordinary vessel, built and stencilled by Grandfather Commanda himself, his wife Mary and their grandchildren. It was marked in the William Commanda fashion and dated September 1980. The Kitigan Zibi Anishinabeg Elder of Bitobi Lake in Maniwaki, Que. was laid in it, and both boat and builder were ensconced in the eight-sided lodge, also designed and built by Commanda, until it was time for a coffin burial on Aug. 5. On the very day he was returned to his Mother Earth, the annual Circle of All Nations – which many believe served as William Commanda’s great “going away party”–was set to begin. Knowing he would say, ‘the show must go on’, Grandfather Commanda’s countless friends came together to hold the 42nd annual event, held in a succession and hosted by Commanda at his home since 1969. They animated his beliefs in love, equality and sharing so that once again the international crowd that regularly attended the spiritual gathering could experience his aspirations. Yet, the masses came, including leaders and representatives of First Nations, Métis and Inuit organizations, federal and provincial politicians, foreign diplomats, environmental activists, and spiritual Elders from across Canada and beyond the border. Artists, musicians, writers, filmmakers, police, fundraisers, guests from France, Belgium, the United States and South America, and “grassroots folks” and children arrived during the three-day gathering. As darkness fell on Day One, Friday, the documentary “The Portage of Wisdom”, produced by Circle of All Nations supporter and environmentalist Patrick Gravel, was screened. Discussions during the weekend focused on how Grandfather Commanda’s work would continue, especially his vision of establishing a National Aboriginal Centre on Victoria Island in Ottawa, as well as the protection of sacred and special sites. “William saw development of the centre as urgent, as a place where united voices could offer Indigenous wisdom regarding environmental stewardship and national and global peace building,” Thumbadoo said. But, first, a strong contingent of Aboriginal leaders must come together to plan it out. It can be no other way, she added. Generally, the one of a kind spiritual gathering ends with a Giveaway Ceremony and drumming and dancing, but this year it seemed Grandfather Commanda, who loved all kinds of music, having learned to play the fiddle as a teenager, orchestrated a grand concert. Entirely unplanned, world reknowned musician Marc Vella arrived with his baby grand piano, and his Caravan of Love of 50 French supporters, followed by a 50-member Belgian boys choir. Grandfather Commanda’s life experience was as diverse as his genius. Born in the early hours of Nov. 11, 1913, his mother named him Ojigkwanong, meaning Morning Star. He worked as a guide, trapper and woodsman. Fully trilingual in Algonquin, English and French, he was named chief of the Kitizan Zibi First Nation from 1951 to 1970, just as his great-grandfather Pakinawatik, who settled Kitigan Zibi after moving from Montreal in the mid 1800s, led his people. Along the way, he learned to craft birchbark canoes, and is renowned for having built 75 of them, even building one for Queen Margrethe of Denmark, and famously helping Pierre Trudeau to repair his. At the age of 90, he shared his canoe-making skills and philosophy in the documentary “Good Enough for Two”. Well-versed in the messages of wampum belts, he carried three of them and shared their teachings: the ancient Seven Fires Prophecy Belt about choice; the 1700's Welcoming Belt about sharing the grand natural resources and values of the original peoples with the newcomers; and the Jay Treaty Border Crossing Belt, which recognized Turtle Island as a coherent entity. Known worldwide for his ability to bridge cultural gaps, Grandfather Commanda travelled the world, including to the United Nations, conducting pipe ceremonies and offering prayers for the earth, waters, animals and people. On home turf, he not only blessed the Human Rights Monument in Ottawa alongside the Dalai Lama in 1990, but also presented Nelson Mandela with an eagle feather from all First Nations in 1998. 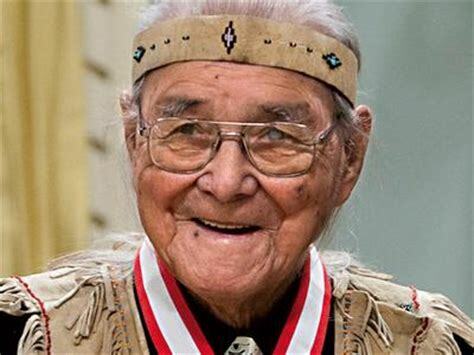 He was named as an officer of the Order of Canada in 2008, awarded the key to the city of Ottawa, given an honorary doctorate degree from the University of Ottawa, and in 2010 received a lifetime achievement award from the National Aboriginal Achievement Foundation. Among the many of Grandfather Commanda’s teachings is the Seven Fires Prophecy, which states mankind will come to a fork in the road and have to choose spirituality over materialism to survive. More of his beliefs and ideology are captured in the books “Learning from a Kindergarten Dropout”, Book One and Book Two, and “Passionate Waters – Butterfly Kisses”. Grandfather Commanda’s wife Mary passed away in the late 1980s. The couple had no children together, but they did adopt Mary’s niece, Evelyn Derache-Commanda. He also adopted Mary’s son, Sonny Smith-Commanda, who died in the 1990s, and his only surviving sibling is Mary Commandant (her name differs from his because a French priest incorrectly recorded it). Aboriginal leaders such as Marlene Jerome, vice grand chief of the Algonquin Anishinabeg Nation Tribal Council, stated in their press releases that “a page of history has closed” with Grandfather’s passing, and Thumbadoo, who gave up her federal government job years ago to help him with his message and work, agreed, saying his faith in love, equality, sharing and grace did not fail him. “He came from a time when Native people didn’t have money, and so they shared and supported each other,” she said. Staging his annual gatherings, and his other work and projects without staff, organization, or financial support, he relied on friends to help him prepare for it, and asked guests to open their hearts and volunteer for security duty, food preparation and clean up. “Ginawaydaganuc – we are all connected – with nature and each other, William always said. It really is that seamless,” Thumbadoo reiterated.